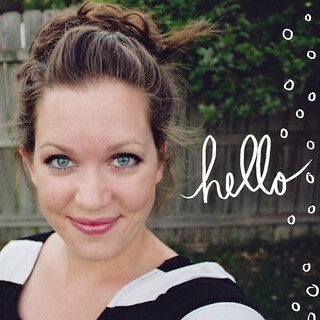 I had the pleasure of sharing a little maternity Refashion over at DIY Maternity. I’m currently preggers and have been having so much fun creating maternity wear. Living in an area where there isn’t much to begin with (as far as maternity clothing), really spurred me on to be a little creative this pregnancy with my clothing. 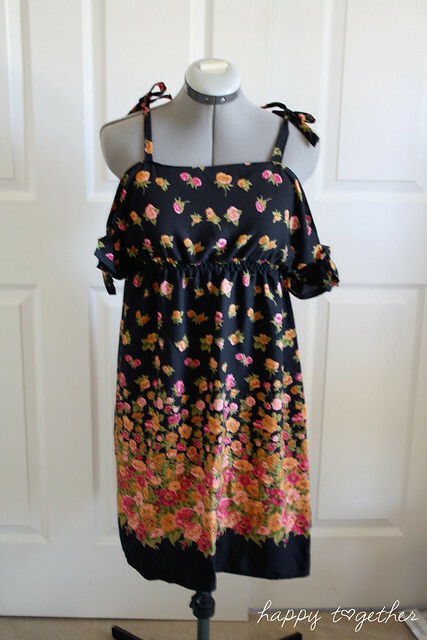 In this post, I’m going to show you how I created this top from a thrift store dress. 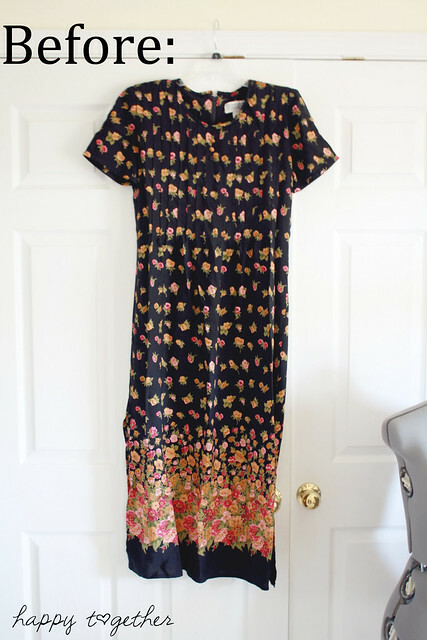 Here is a picture of the before of the dress. I really wanted one that had a border, so when I saw this I grabbed it (especially since my 3 yr old had had enough shopping for the day ;). 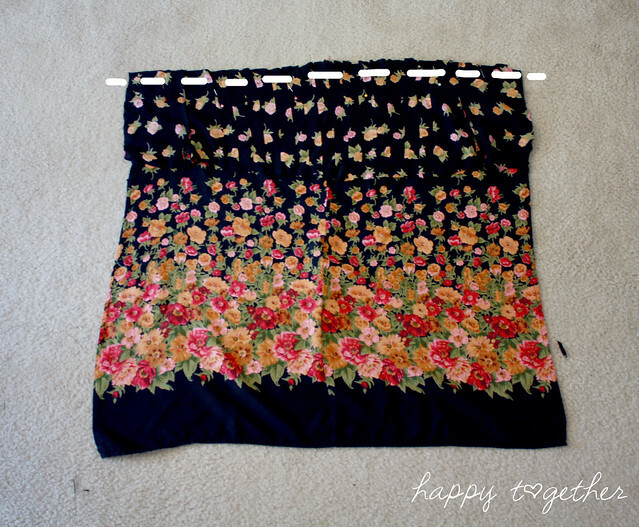 You could also do this with a long skirt or plain old fabric. When looking for a clothing item to use, make sure the area you will cut from is bigger than your belly by a bit so it will fit. I cut four main pieces from the dress. The two smaller ones are the two that will be the top part. I made sure that it was long enough to provide the coverage I desired up top plus seam allowance. 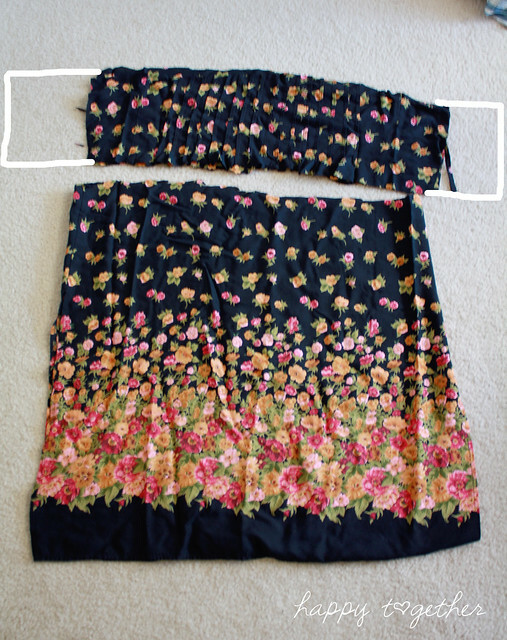 If I had gotten a bigger dress, I would have extended it even more on those top pieces (see white lines in pic below). Unfortunately, the dress I used didn’t quite have enough material for that. The bottom two pieces are the ones that cover the belly and all. I made them as long as I wanted and kept the width the same as the top. Make sure that this width is bigger than your belly. You will bring it in with elastic thread later. 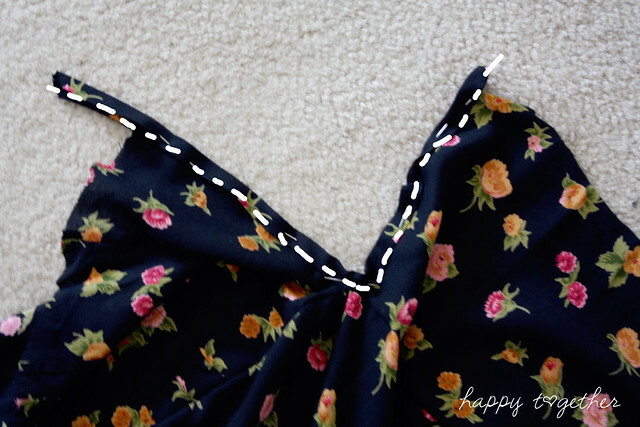 *Tip: Cut the bottom two pieces so the actual bottom is the hemmed part of the clothing already so you can skip that step later. Then for the front, take one top piece and one bottom piece. Place them right sides facing and sew together. This creates one big rectangle. Repeat for the back two pieces. 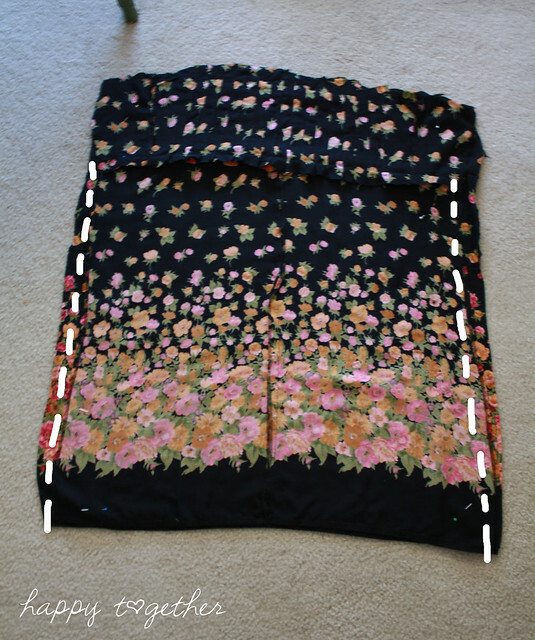 Now place the front and back together, right sides facing, and sew together only along the bottom portion. **I forgot a picture of the shirring, but now is the time to do it. I just shirred three rows, about 1/4″ apart, right underneath the top part. Make sure to do this on the actual bottom piece and not the seam, because if you catch the seam it won’t come in as much due to the thickness of the fabric. 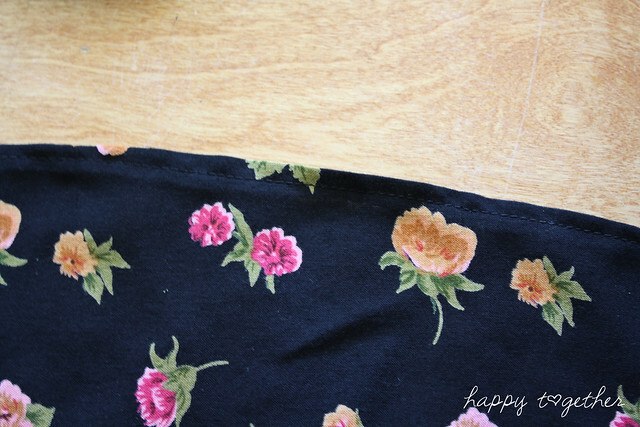 Here is a good shirring tutorial. Create a binding from the material from the clothing item or something else to go around both top side edges. You do this by measuring how long you need it to be (I always add 2 or 3 inches extra just to make sure I have enough). Then make the width about 2 inches wide. Fold the piece in half, wrong sides facing, and iron. (Ignore interfacing in the below pics. I’m using pictures from another project, but same concept). Open up and fold the long side edges to the middle crease you just made and iron. Fold back in half and iron. No raw edges on the long sides any more. Now place fabric inside the binding, pin, and sew in place. Trim any extra length off. Then along the very top of the front and back piece, fold down the front 1/4″ (toward the inside) and iron. Then fold it down 1/4″ inch again (toward the inside) and iron. Pin in place and sew. Now there are no raw edges on the top. If the bottom isn’t already hemmed from using a pre-existing item of clothing, hem the bottom by folding up 1/4″ and ironing. Then fold u 1/4″ again and iron. Pin in place and sew. Now it’s time to create straps. I created 8 straps for making 4 tied spots. You can make them the same way as the binding except fold in the end that will be exposed and sew down the long open edge. Make them as long you desire them to be. Just make sure they are long enough to tie. Strategically place the shoulder straps where you would like them and pin in place. Make sure the bottom is on the inside of the clothing so you don’t see the open ends). Sew them on. You can cover the raw edges of the strap end that is inside with a zig zag stitch if you like (or use a serger if you have one). The next four straps will be used at the very edge of the sleeves. Pin in place and sew on. Again, pick a place that is comfortable for you. If you made the sleeves longer, you might need to do more straps. 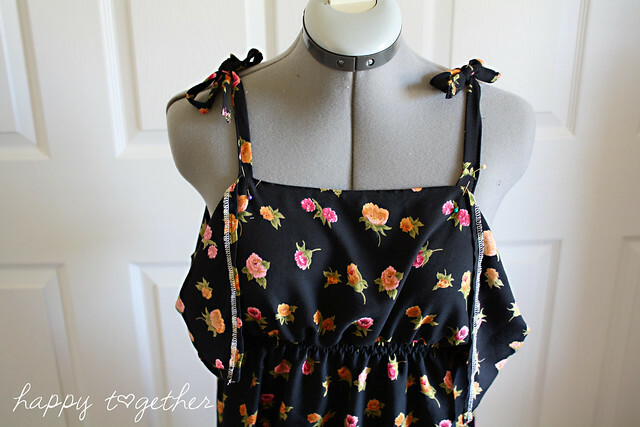 Now it’s all done and you have a fun little refashioned top. Thank you very much for having me Megan!